Money in the Garage: James Dean says, "Secure your load...please!" Despite my boastful blogs, not every thrift store find I buy turns to gold. I have a few duds too, some of which are completely my own fault. 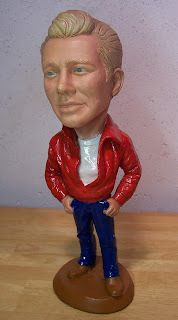 Last year I was in a Goodwill Store and spotted a highly collectible "Esco" statue depicting James Dean. You may not recognise the Esco name, but you probably have seen the statues. Very popular back in the Seventies and early Eighties, these two foot high statues depicted movie, music and sports stars from back in the day. These great old statues included: Bogart, the Stooges and Marx Brothers, the Beatles and many more. A Sinatra Esco statue recently sold on Ebay for $500 big ones! One recent James Dean was listed on Ebay with a "Buy it Now" price of $300! Needless to say, they are highly desired by collectors. If you find one, it's guaranteed money in your pocket. I spotted my James Dean across several aisles and hurried over to take a look. I remember thinking to myself, "It couldn't be a real Esco, I am not that lucky". Well, turns out it was; this James Dean was in excellent shape, no chips or cracks and the price tag read $5.00! I snapped him up in a hurry and was quite pleased with my find. After leaving the Goodwill store, I gently placed James Dean on the back seat of my car. The rear seat was pitched so with his dead weight (they are heavy) I thought he wouldn't go anywhere. I had just left Goodwill and was blissfully driving home when I slammed on my brakes! A student driver just in front of me had come to a complete stop in an intersection. Standing on my breaks, I swerved to avoid the girl and heard a thump in my back seat! Oh-no, not my James Dean!? Turning around in dread, I saw my statue had flown off the back seat and hit the floor. One notorious problem with Esco statues is they are made of fragile chalkware and can easily break. Guess what happened to my Esco James Dean? Yep, he split in half on impact! My potential $300 profit vanished, thanks to my stupidity. I should have "secured my load" as the truckers say. A few extra minutes to safely wrap him or cradle him in my coat would have protected him from quick traffic stops. I took him home and examined him in my garage like a plastic surgeon. The split turned out to be nice and clean. Hoping to salvage some potential profit out of the deal, I glued my James Dean back together again like humpty-dumpty. I posted him in Craigslist and made it clear that he had broken in half but was repaired. A nice couple who collected Escos showed up at my door and paid me $15 for him. Ten dollars more then I started with, but not nearly the potential I could have made...ugh! So don't be a ding-a-ling like me! Make certain you wrap and protect your prized thrift store acquisitions to maximize your profits...and watch out for student drivers!